Some of you may recall grandparents talking about sipping vinegar “back in their day” and how it was good for their constitution, gout, the sugar or insert-any-other-old-timey-ailment-word-here. And really, they weren’t all that off. Although their Windex-styled fix-it-all solution is hilarious, they really were on to something. Anyway, fruit vinegar is easy to make and isn’t super vinegary. In fact it makes a great mocktail. In the heat of the summer, I’ll grab a tumbler, throw a few ice cubes in it, some gassy mineral water (San Pellegrino is my fave) and a bit of the vinegar. The result? A light and refreshing drink that’s outta this world. You’re going to look at it and wonder how you ever bought your own vinegars. Trust me. I do it to myself. In the mirror. True story. I frequent vinegar shops all the time and have been known to drop $100 on a few bottles of fruit vinegars. Yea. I did that. A lot. Whoops. Your fruit shouldn’t be moldy or rotten. They should be fresh, not frozen (I made that mistake once). Scraps work, too! And they’re economical. Which I like. Bruised fruit is also okay. Use peels, rinds, cores, etc. Use organic. If you can’t afford organic, ask your organic grocer if they have “seconds” in the back. Sometimes they’ll sell you those for a discounted price. Also, if you can’t use organic, stay away from using peels. It’s a lot of sugar, but you need to feed the bacteria something. By the time it’s all processed and fermented, the sugar count will be much less, making it usable if you have a special diet. Keep fruit submerged with a glass plate, rock, plastic lid (like a yogurt lid, BPA-free). A bowl or wide-mouth jar works best because it encourages oxygen. Save the mother!!! If it develops a mother, save it for a starter for the next batch (and omit the apple cider vinegar). The ratio is 1 part fruit to 2 parts water. Put scraps in the jar or bowl. Use a rock, plate or a plastic lid to keep fruit submerged. If it won’t stay under, stir daily to prevent mold growth. Let it sit on the counter for a week and then strain out all the fruit using a fine mesh colander and a coffee filter. Return the liquid to the container and cover it again with the cloth or filter and let it sit another 3-4 weeks. If white yeast develops, called Kahm yeast, try to scrape it off – it’s not bad for you. So don’t worry. Otherwise, you can strain it out in the end. If mold develops, also known as the fuzzy stuff, pitch it. Bottle in narrow-neck bottles, cover and store indefinitely (as in it doesn’t go bad) at room temperature. I freaken love all things dill. When I was a baby, I would beg my mom and her friends for their kosher dill pickles when we were out at Rose’s (a New York deli here in Portland – back in the 80s, they were in their heyday and their food was FANTASTIC). After a few kosher dill pickle spears, my lips would be white from all the vinegar. I didn’t care. I wanted more. And my mom and her friends wanted to laugh even harder. It was a win for everyone. Fast forward 30 years, and I still love my dilled foods. I bought a bunch of green beans two weeks ago and realized that with my neck, any and all cooking wasn’t happening. So, before they had an opportunity to rot on me, I shoved them in a jar with some scapes I had also bought with the dream of sauteing them in butter… Yea. Not happening, either. Two weeks later, I cracked open the jar and my goodness! Childhood memories of eating dill pickles until my lips turned white came flooding back. They are so. so. so. good. Even the roommate who sometimes thinks my food is a bit hippie (admit it. I know you think this – and I know you’re reading this post), wanted more. Okay. Enough of me typing. You want to hurry up and make these. And then wait two weeks. It might be the longest two weeks of your life but you’ll have to deal. Note: The grape leaves sound random but they help maintain the crispness of the vegetable. Other options are a bay leaf (or two). Leave water out for at least 30 minutes to evaporate trace minerals. In the meantime, weigh out the salt and rinse green beans and scapes. Trim both so will fit in the jar. Add the salt to the water, stir to dissolve and set aside. In your jar, layer the red pepper flakes, peppercorns, and dill on the bottom. Place the green beans and scape spears on top of the spices, stick straight up. Stuff the grape leafs on the side. Pour the saltwater solution atop of everything and work out any bubbles. The veggies or grape leaves cannot be above the water line. Place a dunker (either a clean rock or a glass weight) atop to keep the veggies below the brine line. Seal tightly with a lid and allow to ferment for 3 to 10 days. The beans will get tangier as they age. If mold forms, dump it. I know I’ve been focused on fermenting lately but the bacteria that natural ferments provide are such an important part of the diet. Here’s why: In a healthy gut, up to 5 pounds (yes – you read that right, 5 pounds) of healthy bacteria should be living symbiotically with our body. That’s crazy! Fermented foods aid in that symbiosis by providing the gut with new waves of bacteria as old ones die off. These guys. So tasty. 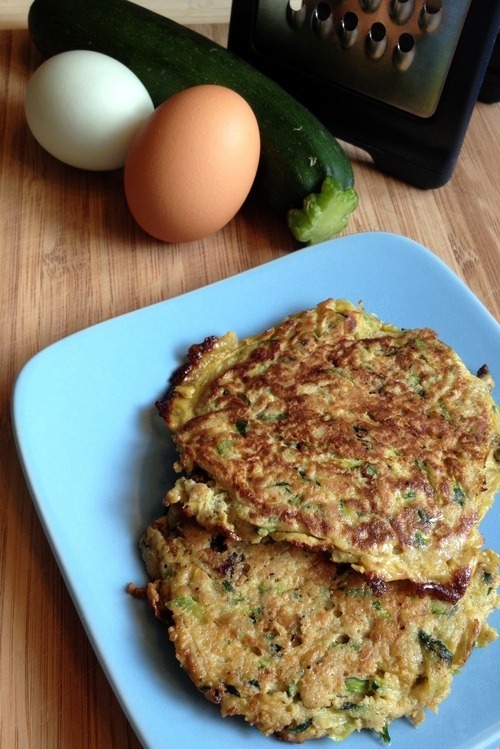 I had plain zucchini pancakes recently and wanted to give them a little flavor kick. (I’m obsessed with savory for breakfast, what can I say?) So these babies were born. I originally served them with fresh pico de gallo, sliced avocados with pink salt and hot sauce. Always gotta have the hot sauce. After I’m done with my 21 day sugar detox, I’ll serve them with a bit of crème fraîche (French fermented cream that tastes a lot like American sour cream – you can buy it relatively cheaply at Trader Joe’s) or some whole milk cojita cheese. Latin American Sauerkraut would also taste fantastic with these. Enjoy! A little note: conventional zucchini is a GMO crop (when at the grocery store, conventional crops start with a 4xxx, organic a 9xxx). Make sure you buy organic zucchini or buy conventional ONLY at Trader Joe’s as they do not carry any GMO products in their produce department. Their open statement on their commitment to non-GMO is only another reason why I love T.J.’s with all my beating heart. In a medium frying pan, cook the bacon over medium heat, stirring often to prevent burning. Reserve the fat in the pan. While bacon is cooking and using a cheese grater, shred the zucchini. Add all of the other ingredients and stir until well incorporated. Once the bacon is done, add to the mixture. Over medium heat, and using the bacon grease in the pan, ladle about a 1/3 cup (pancakes should be about 3" wide) of the mixture. Cook each side until lightly browned, only flipping once. Note: nightshades are not allowed for some on an anti-inflammation diet. If you do not tolerate cumin, red chili powder or cayenne pepper, simply omit. 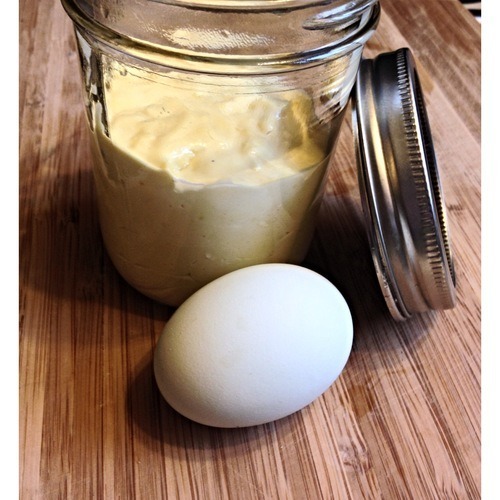 If I had known mayo was this easy to make, I would have stopped buying Best Foods/Hellman’s years ago. (And, no – I haven’t bought it for a few years anyway.) The flavor is a bit different than the conventional brands as mine was soy-free and the oils are different. But it’s creamier and nuttier. My only tip for you – pour the oil very very very slowly. As in very very. A few drops at a time kind of very. This will allow the oil to be blended in completely and won’t break apart the fragments that give it that wonderful floral bouquet once it hits the tongue. Break them apart and… well, it’s nasty, bitter and you’ll want to dump it out. On to the eggs – farm eggs are the best. Soy-free, organic and free-range. If your local farmer doesn’t wash the eggs first, make sure you do prior to cracking them – and really, this only needs to be done if your eggs have visible dirty spots on them. Which, at that point, if your eggs are crazy dirty, the farmer isn’t tending to his nesting boxes very well and you might want to find a new farmer. So here’s my recipe. And my roomies had better watch out – I might be dumping their Best Foods/Hellman’s. But it’ll be doing them a favor. No more excess estrogen from the soybean oil and no more nasty fillers. Just good ol’ simple and real foods ingredients. Whisk all the egg yolks, lemon juice, sea salt, vinegar and dijon mustard together until well blended. While continuing to mix (a hand blender, set on low works best), slowly drizzle the macadamia nut oil, a few drops at a time and blend until completely incorporated. Repeat until all oil is done. Next, add the olive oil, blending a few drops at a time, with a hand whisk, until all incorporated. Stores in the fridge for up to 7 days. 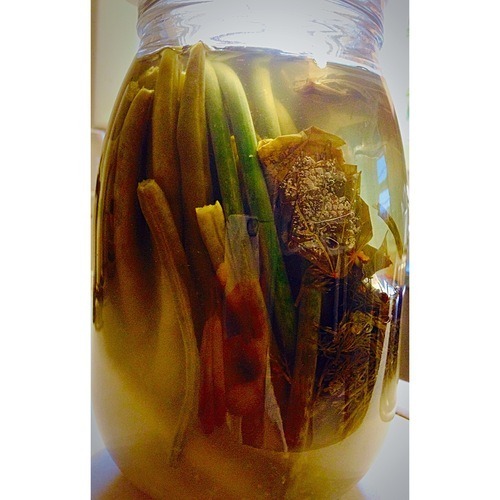 I’m sure by know you’ve noticed that I’ve been on a fermenting kick… it’ll end. I promise. Truth is, having a healthy gut is going to let you absorb the nutrients you’re taking in so much better. I can give you recipes that are “this”-free or “that”-free but if you haven’t given your gut time to heal, given it the nutrients that the body needs to facilitate healing and have repopulated it with healthful bacteria, all of that is for naught. So my latest ferment: Beet Kvass. Sounds tasty, doesn’t it? (Kidding.) It’s definitely an acquired taste and the first few times you make it, you probably won’t like it. But stick with it! Your taste buds will be adjusting and usually people come around. Kvass is salty and picks up the earthiness of the beets. Historically, it was an Eastern European tonic and was more or less the Windex of that area. (Three points for you if you recognize that movie reference. 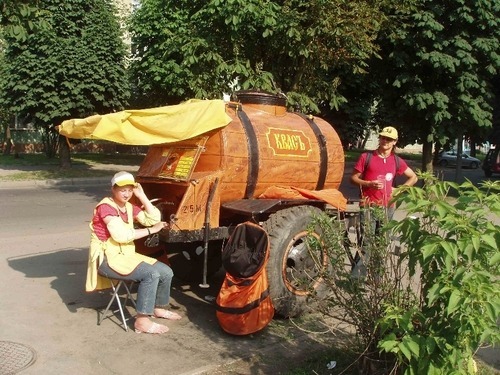 )It’s weird to think that they have carts in Eastern Europe selling this stuff. But, unlike our fried and greasy food carts or 7-11s selling food laden with high-fructose corn syrup and other nasty additives, this stuff is super healthy. Folk medicine values beets and beet kvass for their liver cleansing properties and beet kvass is widely used in cancer therapy in Europe. 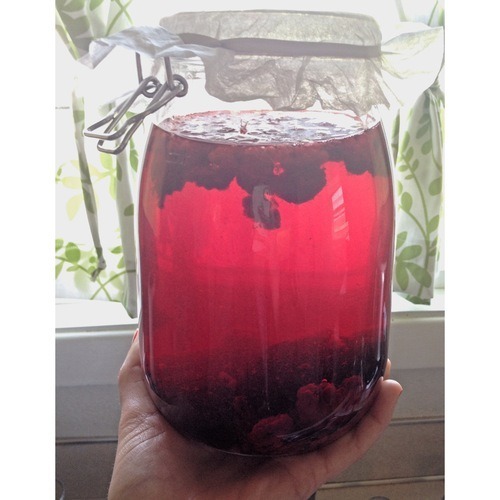 Anecdotal reports indicate that beet kvass is an excellent therapy for chronic fatigue, chemical sensitivities, allergies and digestive problems. So here’s the recipe, inspired by “Nourishing Traditions” – enjoy! Place beets, sauerkraut juice and salt in a half gallon glass container (2 quarts). Add filtered water to fill the container to just below an inch from the top and stir well and cover securely. Keep at room temperature for 2 days before transferring to refrigerator. When most of the liquid has been consumed, you may fill up the container with water and keep at room temperature another two days. The resulting brew will be slightly less strong than the first. After the second brew, discard the beets and start again. You may, however, reserve some of the liquid and use this as your starter instead of the whey. So what exactly is a preserved lemon and why do I make them instead of buying them? To answer the second question first, I’m cheap. I said it. I’m not afraid to admit that I like to save buck or two where I can. To buy 12 oz. of preserved lemons from Williams and Sonoma, it’s going to cost $14.95 and 12 oz is probably going to get you only two lemons. That’s $6.50(ish) per lemon. At that price, they had better be grown in a pristine environment and completely organic with only the freshest and most pure air and water available. My lemons (and I made 8 of them, btw) cost me less than $5 and about $0.45 for the salt. Umm – yes. I can afford that. The whole lemon becomes edible, rind and all – so I’m really getting my dollars worth. Okay. Now for the fun part and to answer the first question: Preserved lemons are a staple in Moroccan food. If you’ve never had Moroccan food, you’re missing out. It’s packed full of flavor and lots and lots of spices (namely turmeric which my stomach seems to love more than any other spice out there for its anti-inflammatory properties). They’re used in chicken dishes and other flavorful delights. When these puppies are done, I’ll post the recipe for the roast chicken. I’m wondering what a piece of rind would taste like in a martini, but that’s just me and I might have to try it out when these are done. I’m willing to bet it would be fabulous! The rind also tastes delicious in a vinaigrette, or add a little bit of the fermented juice for a bit of a zip in your dressing! Or toss a little bit of the rind in your fresh salsa for a citrus zip (your guests will never guess) or toss some some minced rind with some cauliflower and capers prior to roasting. I’ll be providing recipes once they’re done. 🙂 Basically, the possibilities are endless. They also make WONDERFUL Christmas, birthday or host gifts. The lemons will continue to ferment after the period of one month. Feel free to keep them on the counter for that one to two years if you like. However, the flavor will continue to change and will ultimately have a nice minty flavor. If you like the flavor that they’re at, simply put them in the fridge and fermentation will stop/slow down. Lemons. Duh. Organic is best. But, if you have to, conventional lemons will work, too. Just make sure you remove the wax coating on the outside. To do that, drop the lemons in a pot of boiling water for 10 seconds. Remove and, while the lemon rind is hot, wipe away the wax with a clean dishtowel. Repeat until all lemons have been stripped of their wax. Last thing: Make sure your hands are clean as you’ll use your hands a lot in this process. Avoid using anti-bacterial soap when cleaning your hands, but do wash for 20 seconds, making sure to clean under your nails, between fingers, etc. 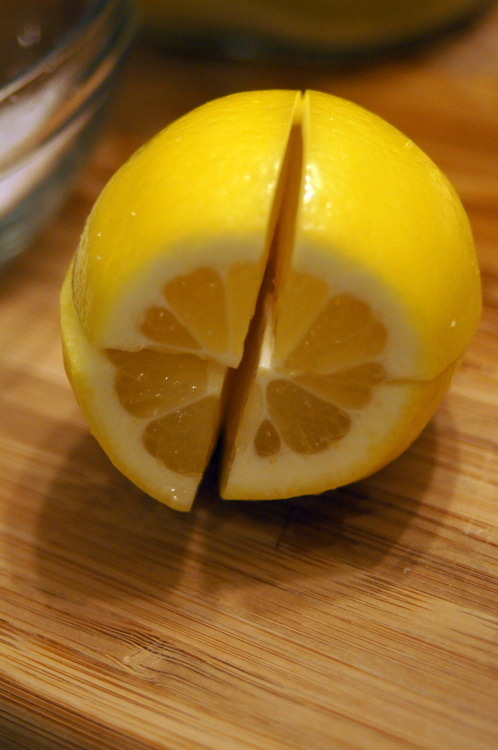 Cut the stem end off of the lemons and then cut the lemons into quarters, being careful not to fully cut through and separate them. See picture below. 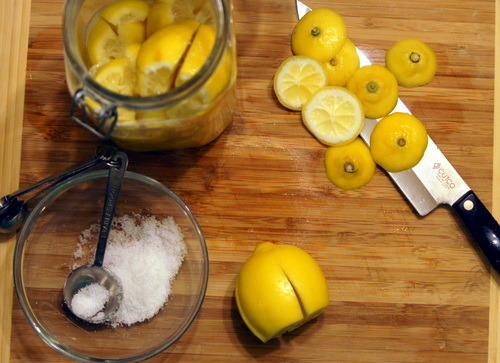 Stuff 1 tbsp sea salt into the cut cavity of each lemon and press it down into a clean canning jar. Punch it down with your fist until it’s squished and juicing. Repeat until the jar is full. Squeeze a few more lemons and pour the juice on top of what’s already in the jar. 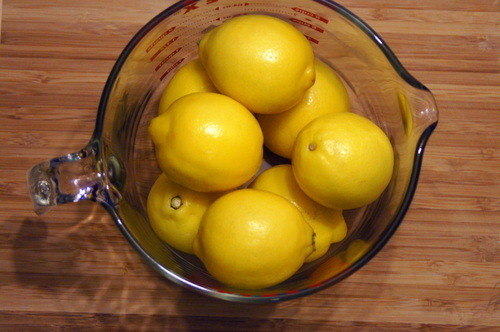 Using a clean rock or some other weight, push the lemons down below the liquid line and leave in place. Store in a cool, dry place for a month. Do not open, except slightly so as to “burp” – this should be done daily. Note: If weird colors start growing (namely black colors), dump immediately. But really, lacto-fermentation is very safe, given all tools are clean. My best friend flew in late last night and I needed something quick to feed her for breakfast before she hopped her train north. 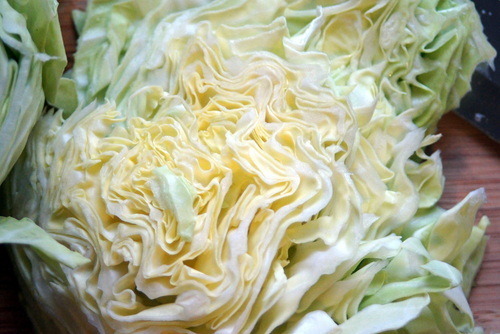 I’ve also been on a cabbage kick – it’s a winter veggie and it’s best to eat veggies that are in season locally. They have the nutrients that your body needs to help you cope with whatever season you’re in. Sauteed cabbage is sweet and delicious and filling – especially when coupled with a protein. This morning, the protein came by way of salmon. Always a win in my book! I tend to cook my cabbage in some way before I eat it and never ever eat it raw. 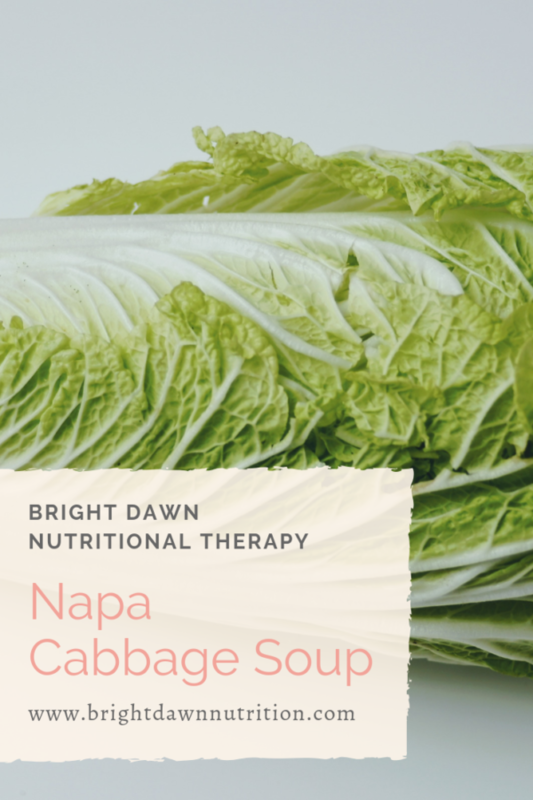 For those who have thyroid health problems, namely hypothyroidism, it is best to avoid raw cabbage as it brings thyroid hormone levels down even more. I like avoid that and still get the vitamins A, C and K, phytonutrients (which act as antioxidants) and lots fiber, folate, calcium and potassium my body needs. Basically, cabbage is a powerhouse and one that I would rather not miss out on! In a medium skillet over medium heat, melt the bacon fat and add onion. Saute until onions are almost translucent and add cabbage. Add salt and pepper and vinegar and saute for about 10 minutes, stirring often.